The Fishermen's Co-op - or to give it its official title the "United Fishermen's Co-operative Society (St Ives) Ltd. - was formed on the 9th February 1920 after a meeting of about 70 interested fishermen was held at the Town Hall on the 14th January 1920. 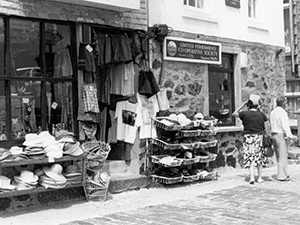 The shop was familiar to everyone who lived in “Downlong” where many fishermen lived. It has been recalled as an Aladdin’s Cave full of many interesting things such as oilskins, leather sea boots, lanterns, glass floats, ropes, nets, nails and screws hanging from beams or scattered on the floor. All mixed up with the smell of paraffin and linseed oil. It was then and still is today a very distinctive shop. Although refurbished in recent years it hasn’t lost its character. The Society also owned a Bark House and Stores near The Island, between the Porthmeor and Porthgwidden beaches. The Bark House was used for the treating of ropes and nets but with the development of manufactured fibres, nets and ropes didn’t need treating any more. There wasn’t a need for such a facility so The Society closed The Bark House and converted it into more stores for the use of fishermen and others. A cottage known as “Shipaground Aft” at the back of the shop, which was used as a store, has now been refurbished and is available as holiday accommodation.